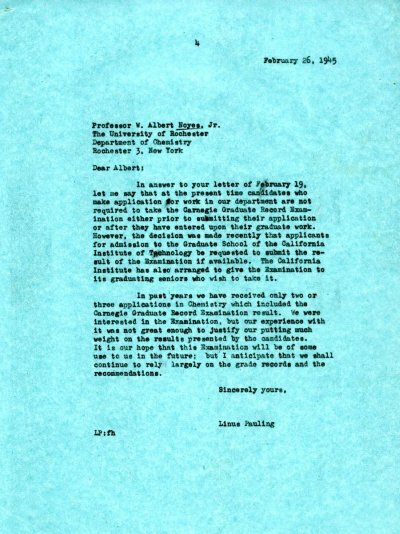 In answer to your letter of February 19, let me say that at the present time candidates who make application for work in our department are not required to take the Carnegie Graduate Record Examination either prior to submitting their application or after they have entered upon their graduate work. However, the decision was made recently that applicants for admission to the Graduate School of the California Institute of Technology be requested to submit the result of the Examination if available. The California Institute has also arranged to give the Examination to its graduating seniors who wish to take it. In past years we have received only two or three applications in Chemistry which included the Carnegie Graduate Record Examination result. We were interested in the Examination, but our experience with it was not great enough to justify our putting much weight on the results presented by the candidates. It is our hope that this Examination will be of some use to us in the future; but I anticipate that we shall continue to rely largely on the grade records and the recommendations.